In the evening, my immediate family gathered at the flat of my brother who now lives in Brighton. 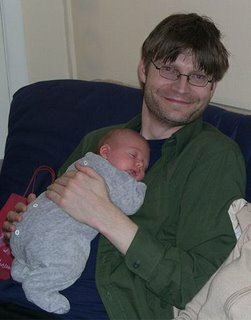 He was proudly parading his first-born son now three weeks old. He is the first of the children to sprog and this has made my mother very happy and decreased the pressure on my sister and myself to increase the world population of Mores. Being a guy, when I am forced to hold it I do so as if it is a load of compressed half-digested milk held together with tissue paper, frightened that my rough skin will cause it to rupture or at the very least leak a little. In fact babies are tougher than most men think. However if the wind changes direction they develop a rash. The only picture with Kian where I am not looking terrified. Dinner was barely touched by Catherine and I. Once you’ve tasted Sardine on Toast Sorbet, even Sino-Indian isn’t going to seem the slightest bit interesting. 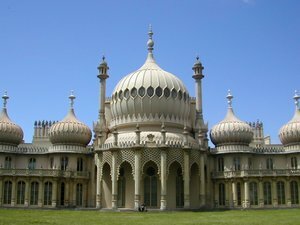 Brighton Pavilion - One of Islam’s holiest sites outside of the Middle East and Bradford.